As a seasoned ghost-hunter, I've spent plenty of time in creepy places - especially in the dead of night. There's a edgy thrill to it, akin to watching an old back and white horror movie. 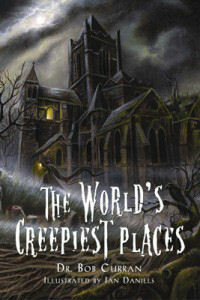 In this latest book, Bob Curran describes a selection of creepy locations around the world, and the history behind their alleged ghostly activities. A chapter is devoted to each location, and the selection is quite off-beat - the Czech Republic's Houska Castle, the Great Karoo in South Africa, and Dragsholm Castle in Denmark to name but a few. Playing to his strengths as a story-teller, he devotes most of his writing to the background history of the location. Rather less time is spent compiling eye-witness accounts of paranormal activity. As a result, the book becomes something of an alternative travel guide for weird and disturbing places around the world (a point Dr Curran allows in this concluding comments), although admittedly some places are not exactly on the tourist trail (like Yumbulagang in Tibet, and the Eilean Moor lighthouse in the Scottish Hebrides). Castles and crypts take centre-stage in the gothic procession. Many of the castles were the stomping grounds for powerful men and women driven to a litany of evil deeds (like Csethje in Hungary, and Leap Castle in the Irish Midlands). The horrors inflicted upon their victims and enemies in the bowels of these castles were truly diabolical, and so it is little wonder that such environments take on a disturbing quality in their own right. 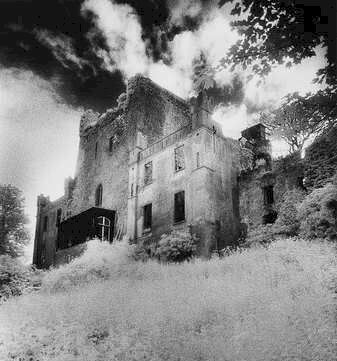 Dr Curran describes his own ghostly encounter in Leap Castle, whilst filming. He asks whether "buildings actually absorb something of the evil or misery that had unfolded within their confines?" (p110) He concludes that although the creepiness associated with them can be due to the historical context of the building, it also relies heavily upon subjective perception and attitude in the visitor. Our anticipation of horror creates the creepy feelings we associate with the environment, and helps generate the haunted atmosphere associated with it (pp188-9). Such feelings, he argues, reflect the distinction between the suspense contained in old horror flicks from the gore-fests of contemporary "schlock horror". He makes a good point, I think. Another strong theme in the book is how a place takes on a dark reputation as a result of local gossip, much of it malicious. Superstition and ignorance play their part in condemning a house or historic building to haunted status, irrespective of whether supernatural or paranormal events actually take place there. Gore Orphanage Road in Ohio is an example of this, and Dr Curran devotes many pages to the suspicions of institutionalised mistreatment of children at the orphanage there at the turn of the 20th century, subsequently linked to the modern myth of 'Melon Heads'. Another American example where local tittle-tattle and superstition have elevated a building' supernatural reputation to legendary status is Old Emmanuel Hill Church in Kansas, which is said to have been built upon a portal to Hell. There seems little historical basis for such a belief - it's just accrued over the years in local folklore, and become a focal point for college students seeking a ghostly thrill. Some of the locations he describes are less horror-ridden and just downright weird. I very much enjoyed reading about the history of Winchester Mystery House in Dan Jose, California - a whacky example of what happens when you combine riches and madness. The Capuchin Mausoleum in Sicily is another example, where tourists on a macabre day-trip can see mummies decked in full formal regalia in the crypts below Palermo. Other places have a more established reputation as haunted dwellings, like Studley Park in Australia - an historical house that is genuinely the subject of paranormal activity, said to be the result of a boy's tragic drowning at a nearby dam. The turnover of owners down the decades, and abandonment of the building, are testament to weird goings-on there. I enjoyed this fascinating book. There is a lot crammed into it - the typeface has been driven down in size to incorporate it all - making it good value. The selection of locations is also good. Often, they are not well known, allowing the author to lead the reader into uncharted, murky waters. Enough to get me in the mood for that next ghost hunt!